1. Global Situation. Influenza is an acute viral disease o f the respiratory tract caused by influenza viruses A, B or C. These A, B and C viruses are antigenically distinct and there is no cross immunity between them. While all three influenza viruses may affect humans, in lower animals and birds, influenza A viruses are o f primary concern. Influenza A viruses are divided into subtypes based on two glycoproteins (haemagglutinin and neuraminidase antigens) present on the surface o f the virus. There are 16 haemagglutinin (H) antigens (1 to 16) and 9 neuraminidase (N) antigens (1 to 9). 4. The persistence of HPAI since 2003 has fueled warnings that a global pandemic is imminent and inevitable for the following reasons: The persistence o f HPAI since 2003 has fuelled warnings that a global pandemic is The epidemics caused by avian influenza are affecting progressively a larger number of countries with evidence for spread to previously unaffected countries. The epidemic is spreading geographically within the countries and affecting larger number of intermediate hosts. The strain o f H5N1 is highly pathogenic, associated with very high case fatality rates. There i s evidence for animal-to-animal transmission and occasionally animal to human transmission but no clear case o f human-to-human transmission o f the disease. Influenza virus is highly unstable and its behavior i s unpredictable. There are concerns about the re-assortment o f the virus and mutations into a new strain with a potential for human to human transmission. 5. Avian influenza viruses are not easily transmitted to humans, but this can change due to mutations or genetic re-assortment (mixing o f human and animal influenza genes). Continuous transmission o f avian influenza and gradual expansion o f the host range and the geographical spread increase the possibility o f influenza pandemic emerging in the near future. 7. Though random sero-surveillance o f poultry across the country and o f migratory birds in their nesting habitats in water bodies was in force from 2001 as an early warning mechanism for HPAI in India, the outbreaks in Nawapur, Maharashtra initially escaped notice and were actually brought to official recognition through local alerts o f large scale mortality among caged birds in organized poultry farms in Nawapur, Maharashtra and Uchchal, Gujarat beginning the last week of January and continuing through most o f February. On confirmation o f HPAI (H5N1) outbreak by the High Security Animal Disease Laboratory (HSADL), Bhopal, on February 18, 2006, the Central and State Governments and the Local Authorities swung into action with alacrity and stamped out the infection in this area by the end of February through: (i) strict and mandatory zoo-sanitary measures; (ii)culling and destruction of i n-contact as well as all susceptible poultry (in organized farms as well as backyards), in-contact feed stocks and eggs within a radius o f 0 -10 km; (iii)pu blic health measures such as active surveillance o f all families in the area by house to house search, isolation and hospitalization o f all suspected human cases; (iv) awareness campaigns; and (v) restriction o f movement o f human beings and live poultry / poultry products in and out o f the infected zones. Following an intensive surveillance o f incontact personnel, households and labor force, the Authorities (Ministry o f Health and Family Welfare) have now concluded that there were no cases o f HPAI (H5N1) infection among human beings in the area. 8. HPAI (H5N1) again broke out among free ranging indigenous fowl in backyards in several villages (Marul, Savda, Hated and Salva) o f the Jalgaon District o f Maharashtra, spread over an area o f nearly 150 km2, officially recognized on March 14,2006. Here again the outbreak o f the disease was noticed on account o f local alerts o f high mortality rates among the free ranging fowl in backyards in villages starting from the end o f February and confirmed as HPAI (H5N1) by the HSADL, Bhopal on the 14th o f March. Vigorous Control and Containment procedures were set in motion and culling o f backyard fowl, destruction and disposal o f all susceptible species o f poultry, back yard as well as farm flocks, contaminated feed stocks and eggs, in areas 0-10 km radius around all foci o f infection were carried out. 9. While the outbreaks in groups o f villages in Jalgaon reported on 14th March were brought under control, serum samples from other villages in the area (Varad, Paldhi, Bhadgaon and Parola) and from villages across the border in Madhya Pradesh (Ichchapur, Burhanpur District) sent to the HSADL tested positive on March 28th. This campaign was widened to a larger number o f villages in the Jalgaon district (Pachora, Mehunbare, Nandra, Mohida, Muktainagar, Salbardi, Kamkheda, Pimpri, Vitava, Sakali, Weghari, Nandgaon and Bodarde) after new samples tested positive on April 4-5,2006, Three other villages (Janave, Jalgaon, Ichkheda; all in Jalgaon district) were included in the campaign after some samples originating from this location were reported positive on April 18,2006. 10. The control measures adopted in all the outbreaks were stamping out o f entire poultry population including destruction of eggs, feed, consumables, litter and other infected materials around 10 Km. area surrounding each outbreak location, restrictions on movement of poultry, poultry products and personnel to and from the area o f outbreak, disinfection and cleaning up of the infected premises etc. A total o f 1,044,509 birds have reportedly been culled (Surat district in Gujarat: 91,886; Nandurbar and Jalgaon districts in Maharashtra: 323,585 and 616,195 respectively; Burhanpur district in Madhya Pradesh: 12,843). 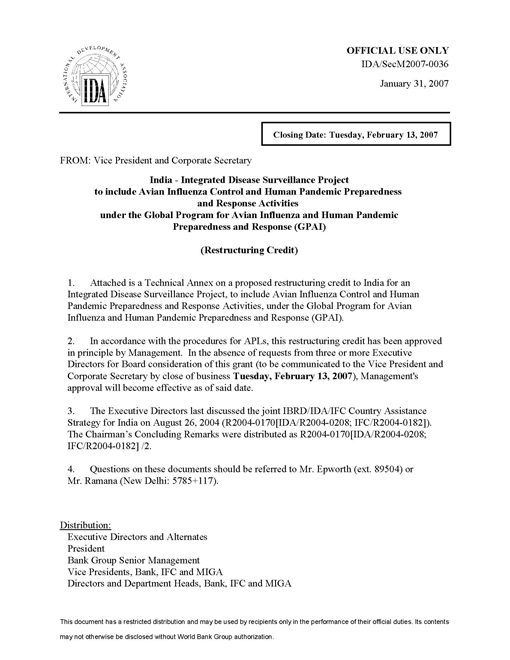 Following the last outbreak reported on April 18,2006, final cleaning up and disinfection process was completed on 7 May, 2006. 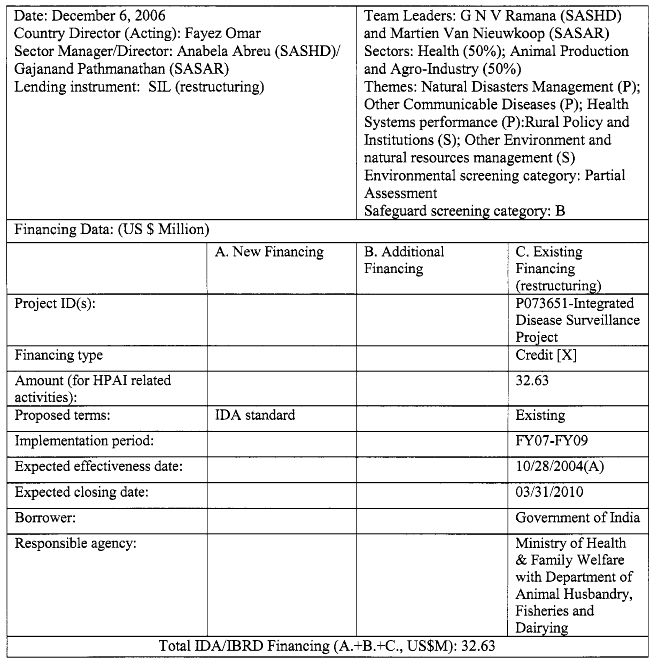 In all cases o f outbreaks in Maharashtra, Gujarat and Madhya Pradesh the state governments have paid compensation on the spot for back yard birds destroyed as well as to commercial operators upon completion o f the cleaning-up and disinfection process. 1 1. Suspected human cases isolated and hospitalized, in-contact personnel, labor force and households under surveillance in the area have all tested negative for H5N1 infection. Rapid response teams and State / Central authorities have ensured compliance o f all mandatory zoosanitary / public health measures.